Hi, please comment. Thanks for Palat for playtesting and good advices. Sitting an imposing 757 metres above the Alsace plain, the Haut-Koenigsbourg castle has all the necessary assets for a fortress. Its strategic position, relatively easy to defend in former times, now provides visitors with an exceptional panoramic view over the Alsace plain, the Vosges Mountains, the Black Forest and even -on a clear day- the Alps. Year 1633, thirty-year war lasts and attract more and more victims. Swedes plunder whole German Empire, but believer men never surrender, in conclusion They stand in defence belief. To castle Haut-Koenigsbourg come terrible message. Enemy unrelentingly approaches, winning in turn lying near Rhine castles. You are captain Philippe de Lichtenau, the commander of garrison in castle Haut-Koenigsbourg and You more and more begin worrying about far fates of fortress. Supplies are not until so large, to hold out long-lasting siege, so You decide to ask Ferdynand II Habsburg, emperor of Holy German Empire about sending the relief. After week you receive answer, that relieve can not reach, because all squads are already busy defence of castles. You have for every price to keep fortress, because it is very important, therefore, that it will guard border of Empire from the France which is also our enemy. Meanwhile Swedish armies approach unrelentingly to castle. You have not much time, to prepare fortress to long-lasting siege. When fortress be becomes captured, road open for our another enemy - the France, which already prepared to war. Engineers with oil play in this mission very important part, without them will not win, therefore pour out oil really then, when enemy's armies go short-circuit and it is them a lot of. In castle not all armies be placed and finished to fight. Crossbowmen and archers space out on turrets in first wall as well as in central part of second wall ( this was concerned of both the sides in castle), resign the warriors behind internal gate, pikemans and macemans leave on first courtyard. Don't stop recruiting soldiers in barracks. On main tower ( square tower) the best is put ballista, because mangonel can by case destroy walls castle during shooting. Leave several pikemans and warriors to lord's defence. After all these years, I've only played Crusader. But today, I bought Stronghold 1. So, the first map download for my SH1 is this wonderful map by Arn_AFe. Thank you. I look forward to playing it. Hopefully I will get round to a review. This is a very enjoyable map you have here! I have one question,how did you get a pic if the whole map ?is there a special programme i need or can it be done with paint or one of the photo programmes on a pc?Micrsoft picture is one i have. Hello, mate I saw your review request and decided to give this map a go. At first I was sceptical towards the map I though "another historical castle" But after 3 attempts at beating it I'm just gonna come out and say it This is one of the BEST maps I have ever played. I'm giving a shout out to all players that this is truly an amazing piece of work. What can I say dude I played the map 4 times 3 of which were a total disaster. I'm not going to give away how I played (the others need to figure their own routes) but I'm gonna say this: The author has given you more than enough clues. I suggest you follow them or this will be one very long fight. And I applaud your scripting skills: you really provoked the player to fight by "all means" something I'm also trying to achieve in my upcoming map. I won't talk more about the playability as I don't want to spoil anything. But it's a nobrainer-playability here is absolutely perfect. As for the balance: The strange thing is that this map is unbalanced if you play it stright-through. But use a couple of tricks the author left you with and then it's a real fight. When you see the upcoming forces you do nothing but wonder if there is a way to win here: the creativity is encouraged and all of the sudden you use everything in your arsenal to balance out the game. The castle itself and all the features inside help imensley and I advise everyone to expolore the castle thoroughly. The map design is insane how you achieved such a stinning effect using so little from the tools? You leave me guessing. You all see the minimap it has no stunning or unseen features in the terrain-sector. It actually has something much more beautiful. A calm and very realistic environment which ties almost perfect with the caslte. You are one of the few remaining designer who still manages to achieve stuninng effect, bound only on the simplicity of the mapping tools. I really love the look of a good terrain and I hope you continue expanding your style. Keep it simple! Your good at it. To be honest the story had a lot of mistakes, but as this is not your native language I'm not going to hold this against you, as in this review I can't imagine how many mistakes I has made :D The important thing is that the author has provided us with a historical article, explaining the mission and also the past of the castle. As the previous reviewer mentioned, I have to agree that this is one of the few best invasion maps avaiable on Sh1. The fun which the map offers cannot be expressed within words. It's beyond unbelievable. There are certain key-strategies which you have to discover yourself. Without those the enemy will easily overwhelm you. The castle is large and tricky and it takes a couple of times of loosing to actually see how the computer behaves when sieging it. I first deleted the pre-placed siege machines camps, on another try I tried trowing a lot of cows upon the enemy but the enemy missile shooters were just too many and powerful. I decided to use shields but then I got overwhelmed by melee units, the enemy pikemen just killed all my shooters with shields from the keep, killing the lord in the same time. Fire was essential in the end; it took a while to realise it, but that;s what happens when so many possible strategies are avaiable for the players' use. These almost endless choices really entertained me and kept me busy but not bored. I managed to win the map hard and I almost got it on very hard. The scenario is not long so the boring-factor is not present at all, but seriously, on such a well-done map it would be impossible to get bored. Anyways, the computer holds an incredible number of troops. Compared with the player, the scale would be at least like 25 to 1 on very hard. 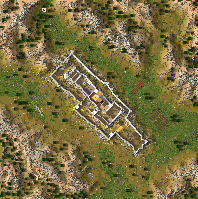 The player has height advantage of the hill plus keep, tower and walls. This advantage however is mostly overrated. Once the enemy brings endless rows of crossbows on the battlefield, nothing can survive to them regardless of their height. I must admit, on first tries I actually lost my king after being shoot by those strong missile troops. On lower difficulty levels one can take the mission to its end without shields, but when trying it on hard or very hard, shields are a bless from the gods. Hand-to-hand combat troops are also requied, the computer has also a large number of them too, so a couple of those so-called soldiers can do a fine job on your side as well. I find incredible how well the AI sieges a castle like this, the ranged troops work in the same time with hand-to-hand combat troops, they cover each other trying the right path to victory. I don't know if it's just luck or a scripting masterpiece but it's definately one of the best attacks I've seen on any maps I ever played before. From the idea of scenario, to the castle reconstruction in the editor itself and the story supporting the map, I believe the author has reached perfection. The mountains and hills are layed perfectly, like they would've been there for thousants of years. The story also a piece of art; the author really showed his level of imagination in every aspect of the map. So-called perfect layout of the mountains within the editor has been reached by mapmakers years ago. These days I can actually feel a fear among the mapmakers to design the mountains somewhere else than in the corners of the map, leaving the centre with few hills and/or plan field. This map is not like those; it's differend. There are obviously hills, since the castle is placed on a hill, would look strange not to have other hills as well. Anyway, what I wanted to point about the design is it's unique. No useless design tricks like some mapmakers use to try. It looks very realistic, natural and another thing which I really consider on hill-placed castles - the stronghold really looked like it was built on a hill, not like a stronghold surrounded by hill. Well, not to forget the last category in reviewing. The author has put an effort in the story and it can well be seen by ... reading it, how else lol. Looking at the picture of the real casyle put by the author in the story text, it makes me even more pleased to see the level of realistic detail of the castle. Anyway, overall it's an awesome story (some instructions or better call them hints are present too) for an awesome map. Well done.